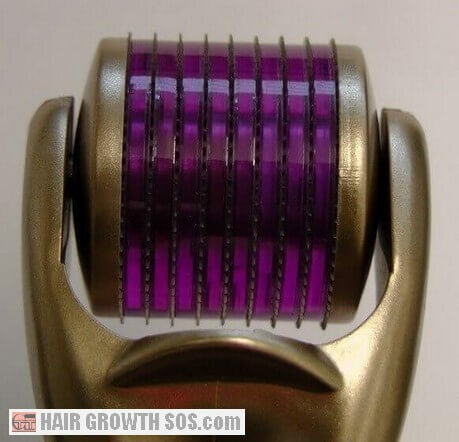 Does the dermaroller (or derma roller) work for hair growth? This review provides answers to those (and other) questions to help you decide if this type of hair growth therapy is right for you. The idea behind using a dermaroller for hair loss is to basically stick hundreds of needles into your head on a regular basis. This form of therapy (called microneedling) along with other topical hair loss treatments you might be using, is said to have a combined effect that might just regrow your hair. At first glance this idea might sound very unlikely (and very unpleasant! ), but there is evidence that this form of therapy can actually stimulate new hair growth. Does the dermaroller Work for hair growth? Yes, a study conducted in 2013 confirmed that microneedling using a dermaroller really can help hair regrow. The study involved 94 men with mild or moderate hair loss. They were then split into two groups. One group was given microneedling one day a week (a dermaroller with 540 needles that were 1.5 mm long was rolled in various directions until the skin just started to go red). And on the other 6 days, they had minoxidil lotion applied twice a day. The other half were just given minoxidil every day. After 12 weeks, the microneedling group had, on average, about four times as much hair growing as the other group. 1. When skin gets wounded, blood platelets accumulate and the repair mechanism* kicks in. 2. Genes involved in the hair growth process get activated. 3. Stem cells also get activated. 4. By perforating the skin, topical products can get better absorbed. * Note: The skin's repair mechanism also includes an increase in collagen production. And a dermaroller can help stimulate this process (it's known as collagen induction therapy). This is actually the main reason why most people use a dermaroller - as an anti-aging skin care product to help tackle skin blemishes, wrinkles, scarring, acne, etc. Comments in forums, Amazon product reviews, etc, give a very mixed picture. However, a lot of men and women genuinely seem to believe that using a dermaroller for hair loss definitely had a beneficial effect. Usually it's recommended to apply a skin cleanser/sanitizer beforehand and a hair growth product afterwards. However, if you do use both a topical product and a dermaroller for hair loss, bear in mind that if you apply the product immediately after rolling (as is generally suggested), then a lot more of it is going to get absorbed. And whilst that might sound great because it should make the product more effective, it might also mean that your body absorbs too much. This is especially true of the drug minoxidil (Rogaine). 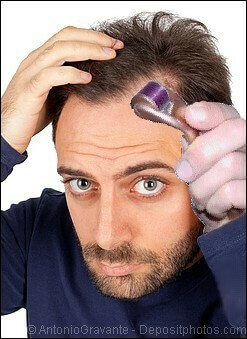 And since Rogaine side effects can be nasty, it's important not to apply it on the same day that you use a dermaroller. 0.25 mm or 0.5 mm needles can be used two times per week. 1 mm needles can be used once a week. 1.5 mm can be used once a month maximum under medical supervision (this, of course, is much less frequent than the weekly 1.5 mm dermaroller treatment performed in the 2013 study). Generally, there seems to be agreement that the longer the needles, the more likely they are to harm rather than heal, especially if used too often. Basically this just means following the instructions carefully. Rolling it the right way, the right number of times, not pressing down too hard, etc. All of which, if done correctly, should maximize results and minimize the risk of side effects from excessive skin trauma or infection. Whilst it might be tempting to just use the same dermaroller used in the 2013 study (540x 1.5 mm stainless steel needles by Dermaroller System (DRS)), bear in mind that the needling procedure was performed by medical professionals. The 1.5 mm needle length is generally the maximum size used for hair loss, but often a 1 mm or even 0.5 mm needle length is recommended instead, especially if you're trying this idea for the first time. 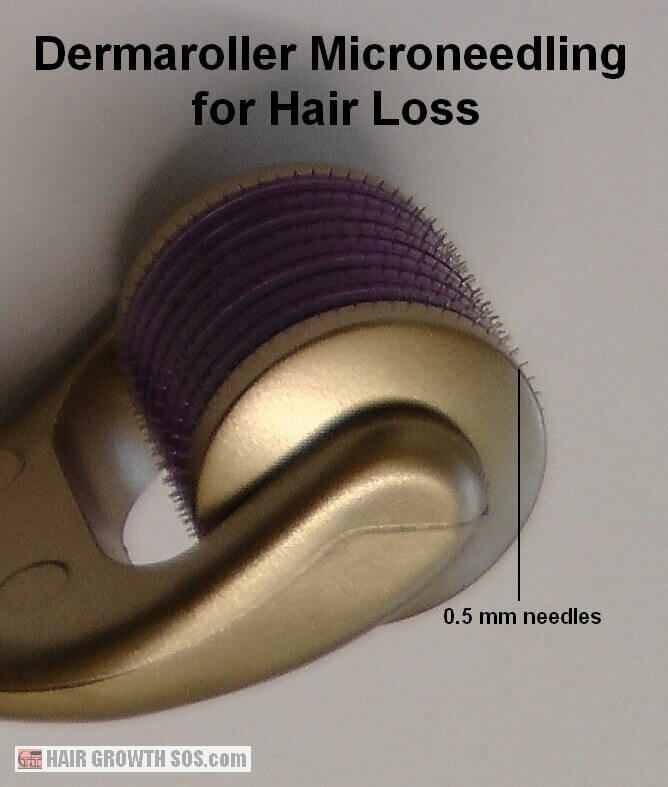 Dermaroller's with 0.25 mm or 0.5 mm needles can help absorb topical hair loss products; Dermaroller's with 1 mm or 1.5 mm needles can additionally cause micro skin trauma and activate the skin repair and hair growth mechanisms. A dermaroller can easily cause side effects by skin trauma if you press down too hard against the scalp. To help prevent this, the total number of needles that dermaroller's contain varies. Generally, the longer the needle, the more needles a dermaroller will have. This spreads out the load on your skin, preventing excessive penetration and pain from the longer needles. So, for example, a dermaroller with 1.5 mm needles might have a total of 1200, and a dermaroller with 0.5 mm needles only has 180. And always remember, you can't force your hair to grow! Research suggests that stainless steel needles are more hygienic than those that contain titanium. But people with metal allergies might prefer trying a non-metallic dermaroller instead. For example, a company called White Lotus Anti Aging promoted a dermaroller on Amazon made from a "biocompatible polymer" which, it claims, is hypoallergenic. Broken bits of needle might be left behind in the skin. Not a nice thought! This might then increase the risk of infection or allergic reaction. Poor results caused by blunt needles which don't properly penetrate the skin and stimulate the repair mechanisms. Keeping the dermaroller meticulously clean is also very important. If you don't, you increase the risk of infection and subsequent side effects. Clearly, an unhealthy, infected scalp is not going to grow hair as well as it otherwise would! Dermaroller hygiene is covered in the next section by the way. Another potential side effect is that, if you're treating thinning hair rather than completely bald areas of the scalp (like receding temples), then you need to be careful not to get your hair tangled up in the roller. Hundreds of needles means there's a high likelihood that you might end up ripping out more hair than you're trying to grow! And that's where hands-on techniques like massage have an advantage. My own remedy for hair loss uses hands-on techniques. And they're now successfully helping hundreds of men and women as well as myself (as you can see from this photo). For anyone who hates needles, there's another way you can avoid using a dermaroller for hair loss but still gain most of its benefits - Dermaroller without the needles. The majority of Amazon reviews I've seen are from people not actually using a dermaroller for hair loss. Most customers, it seems, use them for skin care. Nevertheless, a review is a review. And since hair grows from the skin, that should mean that all these skin-related product reviews are still relevant. Most comments about side effects seem acceptable (e.g., just slight stinging for a few days). But there are a few horror stories such as how the dermaroller they used tore through the skin causing facial scabs and scars. Clearly then, you have to be very careful if you use one, especially if it has longer needles. Amazon Q&A customer answer: Did not sterilize but there was no irritation whatsoever. Amazon seller: Wash it in warm water, but you can use alcohol instead. 2009 medical study (using a dermaroller for skin care, not hair loss): Clean after use in hot tap water, then shake dry. Peptide-based roller cleaners can also be used. Video: Wash dermaroller in warm soapy water, then pour high alcohol content solution over it. Website: Completely immerse the dermaroller with 75% alcohol solution in its container. Rinse with hot water (don't use boiling water - it damages the needles). Website: Pour boiling water over the roller before using it. After using it, put it in an antibacterial cleaner for a minute. Then rinse it with boiling water. Amazon Product description: Use UV light. Website: Only dermaroller's with needles 0.2 mm or less can be cleaned and reused. All other dermaroller's are single-use products and should be cleaned using gamma radiation! However, to stay on the safe side, it looks like it's best to sterilise a dermaroller before and after use. And obviously you have to wash your skin beforehand as well. Despite the huge range of cleaning advice given in the last section, there does at least seem to be agreement that, after use, a dermaroller should be completely air dried before putting it back in its case. To prevent blunt needles, only ever rest a dermaroller on a towel, not a hard surface. If you decide to use a dermaroller for hair loss with longer needles (e.g., 1.5 mm), don't apply any topical products on the same day. So, there it is. Whether you're planning on using a dermaroller for hair loss or skin care, I hope you found this review useful. A Randomized Evaluator Blinded Study of Effect of Microneedling in Androgenetic Alopecia: A Pilot Study. Rachita Dhurat, MS Sukesh, et al. Int J Trichology. 2013 Jan-Mar; 5(1): 6–11.